All Metals Powder Coating have extensive experience in powder coating. AMPC has a conveyorised powder coating plant with online four stage iron phosphate pre-treatment process and cure oven. AMPC have a conveyorised plant and a batch plant to cater for a wide variety of product shapes and sizes. Powder coating is a method of metal finishing. The process involves spraying an electrically charged powder plastic resin onto the surface to be coated. The charged powder resin adheres to the electronically grounded surface and the product is then heated in a curing oven at more than 200 degrees Celsius. The result is a smooth, uniform and durable coating. Unlike liquid paints, powder coating does not contain harmful solvents, and is therefore one of the most environmentally friendly methods of finishing metal products. A four stage pre-treatment process including a phosphate conversion coating is used by AMPC for the preparation of each metal surface. This, along with an essential cleaning procedure to eliminate surface soils and imperfections, ensures a perfect powder coated surface every time. Proper and effective pretreatment is critical to a successful, long-life powder coated surface. Pretreatment of metals is done in order to eliminate the soils and imperfections on the substrate and then the creation of a surface for bonding. The first step of cleaning is essential, and the necessity for such operations increases with the quality of the product. The second phase of pretreatment is the preparation or conditioning of the surface for the powder coating. This is achieved by applying a phosphate coating that reacts with the metal surface, converting it into a dense, continuous layer of either crystalline or amorphous phosphate becoming an integral part of the surface. 1) By providing a surface more receptive to powder. 2) By preventing the spread of under-film corrosion resulting from damage to the powder film. Powder adhesion is improved physically because the layer of phosphate crystals provides a better, more uniform footing than bare metal. In addition, there is a chemical affinity between the phosphate coating and the powder film. No matter how excellent the quality of the powder applied to a steel product, rust can form between the powder film and the steel, unless the steel is protected with a phosphate coating. Readily available resins can provide one or a combination of desirable characteristics including: durability, resilience, high gloss, electrical insulation, toughness, anti-graffiti; and resistance to wear, corrosion, impact, chemical action, and weather. Powder manufacturers now offer a complete range of colours plus excellent colour matching. Consistent finish characteristics and electrostatic “wrap-around” reduce the need for highly skilled operators. Process is easily automated and can include automatic gun movers and/or contouring. All Metals Powder Coating offers powder coating in a wide variety of colours, textures and gloss levels. 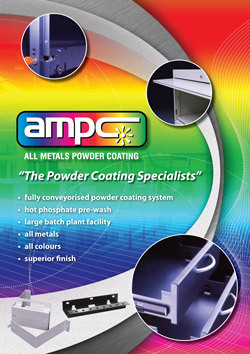 Dulux Powder Coatings is AMPC’s preferred supplier of powders. The Dulux range has a wide variety of colours from the standard range to custom made orders; view the Dulux website for colour charts. Dulux also offer a variety of gloss level finishes (gloss, satin or matt) and various effects (pearl effects range and ripple effects range). While Dulux is the preferred supplier, All Metals Powder Coating are capable of using any major brand of powder. Contact AMPC if you have specific requirements.